With the rapid increase in the variety and quantity of biomedical images in recent years, we see a steadily growing number of computer vision technologies applied to biomedical applications. The time is ripe for us to take a closer look at the accomplishments and experiences gained in this research subdomain, and to strategically plan the directions of our future research. 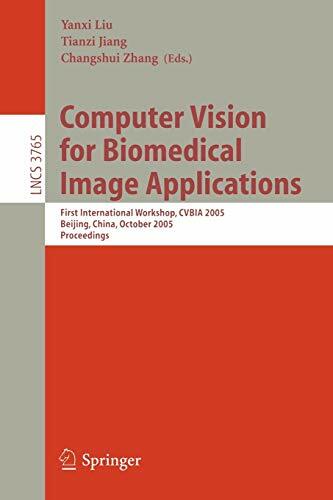 The scientific goal of our workshop, “Computer Vision for Biomedical Image Applications: Current Techniques and Future Trends” (CVBIA), is to examine the diverse applications of computer vision to biomedical image applications, considering both current methods and promising new trends. An additional goal is to provide the opportunity for direct interactions between (1) prominent senior researchers and young scientists, including students, postdoctoral associates and junior faculty; (2) local researchers and international leaders in biomedical image analysis; and (3) computer scientists and medical practitioners. Our CVBIA workshop had two novel characteristics: each contributed paper was authored primarily by a young scientist, and the workshop attracted an unusually large number of well-respected invited speakers (and their papers). We had the good fortune of having Dr. Ayache of INRIA, France to talk about “Computational Anatomy and Computational Physiology,” Prof. Grimson of MIT to discuss “Analyzing Anatomical Structures: Leveraging Multiple Sources of Knowledge,” Dr. Jiang of the Chinese Academy of Sciences to present their work on “Computational Neuroanatomy and Brain Connectivity,” Prof.
Computational Anatomy and Computational Physiology for Medical Image Analysis.- Analyzing Anatomical Structures: Leveraging Multiple Sources of Knowledge.- Advances on Medical Imaging and Computing.- Tracking of Migrating and Proliferating Cells in Phase-Contrast Microscopy Imagery for Tissue Engineering.- Cardiology Meets Image Analysis: Just an Application or Can Image Analysis Usefully Impact Cardiology Practice?.- Computer Vision Algorithms for Retinal Image Analysis: Current Results and Future Directions.- 3D Statistical Shape Models to Embed Spatial Relationship Information.- A Generalized Level Set Formulation of the Mumford-Shah Functional with Shape Prior for Medical Image Segmentation.- A Hybrid Eulerian-Lagrangian Approach for Thickness, Correspondence, and Gridding of Annular Tissues.- A Hybrid Framework for Image Segmentation Using Probabilistic Integration of Heterogeneous Constraints.- A Learning Framework for the Automatic and Accurate Segmentation of Cardiac Tagged MRI Images.- A Local Adaptive Algorithm for Microaneurysms Detection in Digital Fundus Images.- A New Coarse-to-Fine Framework for 3D Brain MR Image Registration.- A New Vision Approach for Local Spectrum Features in Cervical Images via 2D Method of Geometric Restriction in Frequency Domain.- Active Contours Under Topology Control Genus Preserving Level Sets.- A Novel Multifaceted Virtual Craniofacial Surgery Scheme Using Computer Vision.- A Novel Unsupervised Segmentation Method for MR Brain Images Based on Fuzzy Methods.- A Pattern Classification Approach to Aorta Calcium Scoring in Radiographs.- A Topologically Faithful, Tissue-Guided, Spatially Varying Meshing Strategy for Computing Patient-Specific Head Models for Endoscopic Pituitary Surgery Simulation.- Applying Prior Knowledge in the Segmentation of 3D Complex Anatomic Structures.- Automatic Extraction of Femur Contours from Hip X-Ray Images.- Automatic Landmarking of 2D Medical Shapes Using the Growing Neural Gas Network.- Biomedical Image Classification with Random Subwindows and Decision Trees.- Combining Binary Classifiers for Automatic Cartilage Segmentation in Knee MRI.- Computer-Aided Diagnosis (CAD) for Cervical Cancer Screening and Diagnosis: A New System Design in Medical Image Processing.- Constrained Surface Evolutions for Prostate and Bladder Segmentation in CT Images.- Curvilinear Structure Based Mammographic Registration.- Deformable Registration for Generating Dissection Image of an Intestine from Annular Image Sequence.- Distance-Intensity for Image Registration.- Efficient Population Registration of 3D Data.- Efficient Symbolic Signatures for Classifying Craniosynostosis Skull Deformities.- Elastic Interaction Models for Active Contours and Surfaces.- Estimating Diameters of Pulmonary Nodules with Competition-Diffusion and Robust Ellipsoid Fit.- Fast 3D Brain Segmentation Using Dual-Front Active Contours with Optional User-Interaction.- Improved Motion Correction of fMRI Time-Series Corrupted with Major Head Movement Using Extended Motion-Corrected Independent Component Analysis.- Local or Global Minima: Flexible Dual-Front Active Contours.- Locally Switching Between Cost Functions in Iterative Non-rigid Registration.- Multi-modal Image Registration by Quantitative-Qualitative Measure of Mutual Information (Q-MI).- Multi-scale Vessel Boundary Detection.- Non-rigid Registration for Colorectal Cancer MR Images.- Quantizing Calcification in the Lumbar Aorta on 2-D Lateral X-Ray Images.- Real-Time Simulation of Deformable Soft Tissue Based on Mass-Spring and Medial Representation.- Registration of 3D Angiographic and X-Ray Images Using Sequential Monte Carlo Sampling.- Registration of PET and MR Hand Volumes Using Bayesian Networks.- Segmentation and Volume Representation Based on Spheres for Non-rigid Registration.- Segmentation of 3D CT Volume Images Using a Single 2D Atlas.- Segmenting Brain Tumors with Conditional Random Fields and Support Vector Machines.- Segmenting Cardiopulmonary Images Using Manifold Learning with Level Sets.- Shape Based Segmentation of Anatomical Structures in Magnetic Resonance Images.- Simultaneous Segmentation and Motion Recovery in 3D Cardiac Image Analysis.- Spatial and Temporal Analysis for Optical Imaging Data Using CWT and tICA.- Stereo Matching and 3-D Reconstruction for Optic Disk Images.- Total Variation Based Iterative Image Reconstruction.- Voronoi-Based Segmentation of Cells on Image Manifolds.- Parcellating the Intra-splenium Based on the Traced Fiber from Tractography.- Motion Compensation and Plane Tracking for Kinematic MR-Imaging.